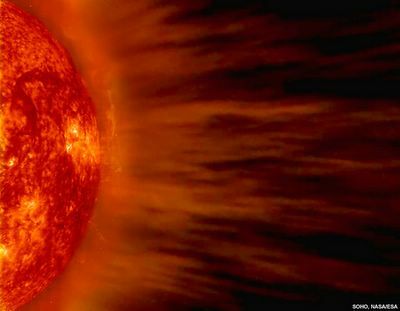 SOHO was launched on December 2, 1995. The SOHO spacecraft was built in Europe by an industry team led by Matra, and instruments were provided by European and American scientists. There are nine European Principal Investigators (PI's) and three American ones. Large engineering teams and more than 200 co-investigators from many institutions supported the PI's in the development of the instruments and in the preparation of their operations and data analysis. NASA was responsible for the launch and is now responsible for mission operations. Large radio dishes around the world which form NASA's Deep Space Network are used to track the spacecraft beyond the Earth's orbit. Mission control is based at Goddard Space Flight Center in Maryland. Originally a two-year mission, SOHO has now operated for over ten years (as of 2006). 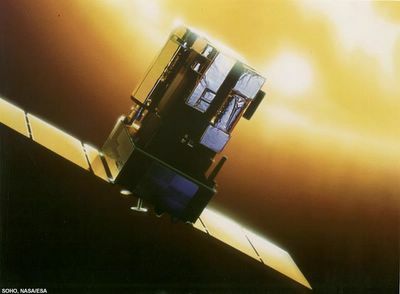 It has proved so useful that a follow-on mission, the Solar Dynamics Observatory, is planned for launch in 2008. 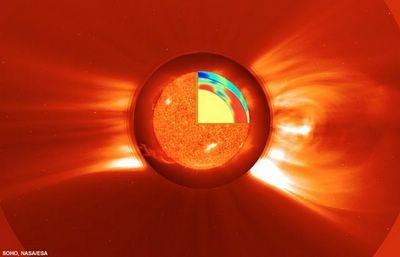 Situated at the Lagrangian point between the Earth and the Sun (at which the gravitational pull from both is equal), SOHO has provided a constant view of the Sun at many wavelengths since its launch. In addition to its direct solar observation, SOHO has enabled the discovery of large numbers of comets, mostly very tiny sungrazing comets which incinerate as they pass the Sun. Humanity's most fundamental understanding of the Sun is as the luminous disk in the heavens, whose presence above the horizon creates day and whose absence causes night. In many prehistoric and ancient cultures, the Sun was thought to be a solar deity or other supernatural phenomenon, and worship of the Sun was central to civilizations such as the Inca of South America and the Aztecs of what is now Mexico. Many ancient monuments were constructed with solar phenomena in mind; for example, stone megaliths accurately mark the summer solstice (some of the most prominent megaliths are located in Nabta Playa, Egypt, and at Stonehenge in England); the pyramid of El Castillo at Chichén Itzá in Mexico is designed to cast shadows in the shape of serpents climbing the pyramid at the vernal and autumn equinoxes. With respect to the fixed stars, the Sun appears from Earth to revolve once a year along the ecliptic through the zodiac, and so the Sun was considered by Greek astronomers to be one of the seven planets (Greek planetes, "wanderer"), after which the seven days of the week are named in some languages.